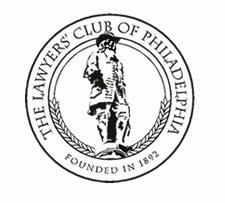 The Lawyers' Club has several categories of members, including a junior membership for those in practice less then three years; regular membership for those in practice three or more years; a judicial membership; and a lifetime membership. The yearly dues entitle a member to three informal cocktail receptions for judges of Philadelphia, and the Pennsylvania and Federal courts. PLEASE NOTE: Click here for our address. Judy Camiel is the Adminstrator and can be contacted at (610) 668-1730 or lawyersclubofphiladelphia@gmail.com.